In Margaret Johnson-Hodge’s 2002 National Bestselling Novel “True Lies”, Dajah Moore and Rick Simmons struggled to hold their love together. In the best selling sequel “This Time”, it seemed that they didn’t possess enough of the emotional glue to do that. But life has a way of following it’s own rules and we see how much in book three –“Tumbled”. The pursuit of happiness hasn’t changed for Dajah or Rick. 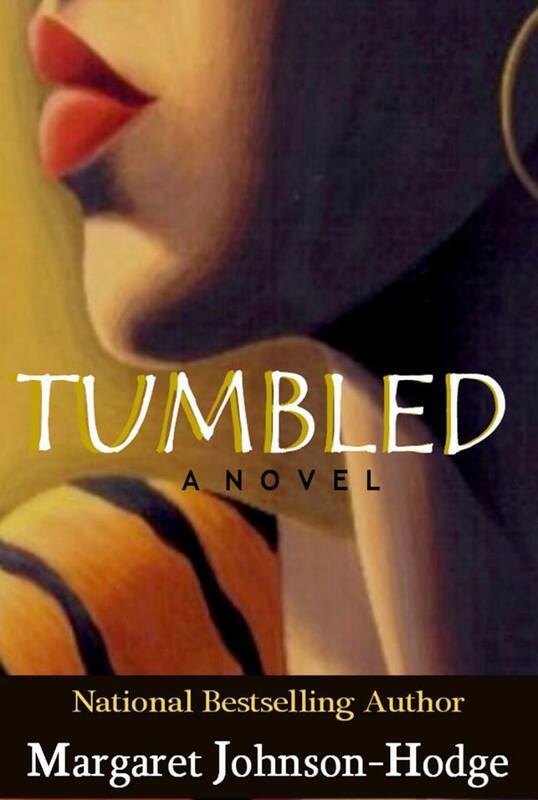 As “Tumbled’ opens, we see just how true that is. But love isn’t simple or easy. It’s messy, complicated, rule bending, but more importantly – life changing. It will have you doing what you swore you never would do and looking in directions you promised yourself you wouldn’t ever look again. With all the twists and turns and ring true-to-life drama that Margaret Johnson-Hodge is well known for, “Tumbled” takes the reader on another amazing journey about getting what we all want: love – pure, simple, genuine but more importantly, real. Back in the eighties, Pat Benatar had sung Love is a battlefield. Dajah knew exactly what Pat meant as she sat on her couch, Jeff on the other end, laughing. She didn’t even know what had struck her so funny, but there she was, mouth open, guffawing and struggling for air. How they even got there, vague. She’d opened the door. Jeff extended some things ‘she’d left behind,’ running down the inventory as Dajah dug in the plastic bag, her favorite perfume part of the bounty and the next thing she knew, they were upstairs sitting on her couch, laughing about something. The ease he brought into her life returned full-force and the why of the whole messy affair faded. She was glad he was there. Glad that she could still laugh. Glad that he cared enough about her to make her laugh. But then it was just her chuckles riding the breeze, Jeff going silent, his eyes on her full. That’s when it struck her. There was no mystery in that. Of course he still loved her. Dajah had known that as she cursed him, packed her things and made arrangements to move out. But Love hadn’t been enough to make her stay. She’d become a rock in that determination. But now, she was feeling more like water flowing around the rock, getting past the block, the hump, the mountain, the thing that stopped their life together. Sitting there with Jeff, she felt everything in her flowing, drifting backward, toward what used to be. Food, good food was as good an aphrodisiac for Dajah as anything. In their initial days, he had treated her to the best hot chocolate in the world. Weeks later, at his place, he had hand fed her chocolate covered strawberries that made her want more. He had tapped into what turned her on and recreated a manual that he studied like he was studying for his LSAT’s. Jeff had infiltrated Dajah like no man had ever done before. How does anyone just say no to that? Dajah had never been into raw oysters until Jeff had opened her up to the perfect ones. A squirt of lemon juice, a dash of hot sauce and the sucking up of the uncooked morsels, just divine. And Kelly, that hug hairy ball of fur that loved her so unconditionally, was missed too. Where was a ‘no’ in any of that? The smell of the sea air infused Dajah. The sun on her face, the sound of seagulls keening in the breeze, the feel of Kelly tugging at the Frisbee, sand beneath her feet, perfect. The sight of Jeff, ten yards away, watching her experience it all, overwhelming. Had she acted too hasty? No one was perfect. Everyone made mistakes. And who else in the whole live world could give her this? What other man knew that playing with a dog on the beach in late April could be as potent as a night of dancing, a weekend getaway to the Bahamas? That being near the ocean was like worshipers going to a spirit-filled Sunday Service for her? Yes, he had slept with that woman, but fear was a crazy, dangerous thing. It made you do stupid things in a blink of an eye and she still had the power of forgiveness. Not for Jeff, but for herself. There was that dress picked out. Wedding colors decided on. The church planned. Best man and maid of honor selected. The promise of life with someone who genuinely loved her. That ring on her left hand. Grandchildren for their parents. Dajah tossed the Frisbee. Watched as Kelly raced toward it. Watched Jeff and his dog play, heart wide opened. Yes, she had the power to forgive. In that moment, that’s where she was headed. There was no more ‘no’ in her. Whatever ‘no’ she had shored up to be used for such a time was gone. Dajah knew it and Jeff knew it as he let them into the place she, for a second, called home, and reached for her the moment he closed his front door. ‘No’ was gone from her vocabulary as his hands moved under her jacket, down into the tight fit of her jeans, cupping her behind like the warm soft half melons they were, and her body, so familiar with him, his hands, the way they molded and moved her skin, opened like a flower bloomed. ‘No” didn’t exist as he eased off clothing, hers, his and they were naked before each other, bodies responding in kind to the snap back of their past, trying to mold a future with limbs and arms, and mouths and racing hearts and sighs and murmurs and whispers and entry and pleasure and pain that made her eyes shut and her mouth opened unable to keep his name out of her mouth. Jeff, a new/old sing song that her heart, in that moment, needed to be sung until there was no more breath, no more ‘no,’ inside of her.